The EVSA 2006 National Reunion is being held in Palmerston North 2-5 June 2006. Registration and accommodation bookings have been opened through forms enclosed with the latest EVSA 'Contact' Magazine. If you are outside the EVSA loop and want to attend email the webmaster for details. If you plan to attend send the webmaster an email and your name will be added to a list published on the website. Apparently Roger Greenaway has moved to Wellington - anyone have an address..? Following the report of the Health Select Committee in 2004, the Government accepted that New Zealand service men and women were exposed to a toxic environment (including Agent Orange) during their service in Viet Nam. The Government established a Joint Working Group to make recommendations on a package of measures to address the health and well being needs of Viet Nam Veterans and their families. The Joint Working Group is chaired by Michael Wintringham, former State Services Commissioner, and is comprised of representatives from the Ex-Vietnam Services Association (EVSA) and the Royal New Zealand Returned and Services Association (RNZRSA), and officials from the Offices of the Minister of Defence and the Minister of Veterans Affairs. The Joint Working Group wishes to consult with Viet Nam Veterans and their families to help it formulate its recommendations to the Government. Written submissions can be made to the Joint Working Group. There will also be opportunity to speak to the Joint Working Group during a series of consultation meetings later this year. Those wishing to participate in the consultation process are invited to register their interest by contacting: www.vietnamvetswg.govt.nz [there are issues with this URL] or Free phone 0800 838-372 (Free phone hours: Mon – Fri 9.00am to 5.00pm). Registrations of Interest will be accepted until 28 October 2005. Those who register will be provided with more information on the submission and consultation process. The deadline for written submissions is Friday 9 December 2005. 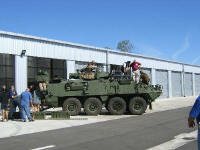 The consultation meetings are expected to begin in mid November 2005. Dates, times and locations of the meetings will be notified to those people who have registered their interest. CSM Doug Mackintosh, one of three W3 veterans to be approached to give an oral record of their perspective of service in SVN, has finished his interview. The website is seeking dispensation from the publishers for the website to publish an extract from the interview [see this item]. The CSM is in good health and living in marital bliss at Spencerville near Christchurch, and promises more stories of his own. The other W3 members to be interviewed are Deni King [Christchurch] and Craig Cocker [Melbourne]. A photo that you may want to put in the web page as I would enjoy seeing some shots of the old W3 boys doing whatever if possible. 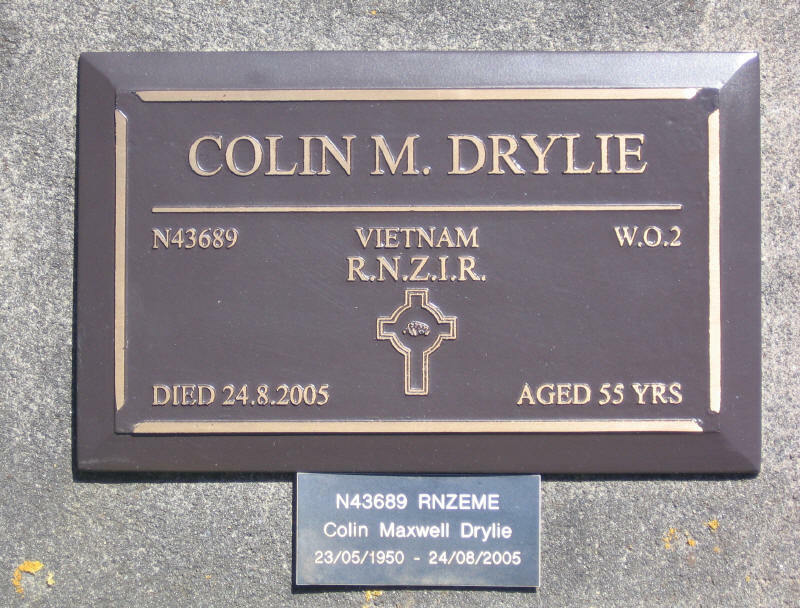 Update 2009: Colin is buried in the Waiouru Camp Cemetery. Colin had transferred to RNZEME for the latter years of his service and retired as a WO2. Ian McGibbon, General Editor War History at the Ministry for Culture and Heritage is currently preparing the official history of New Zealand's combat and medical relief operations in Vietnam. Ian is keen to hear from anyone who has information which may assist him in personalising the history, being particularly interested in diaries, letters or tapes composed at the time by veterans, or their post war recollections. He is not now seeking photographs. Contact Ian in the first instance here. Wayne Holah [official historian NZSAS] has offered the following detail about TWH Heremaia. He also poses some queries, can you help..? "Te Hira Heremaia [nickname 'Hira'] was posted to Vietnam as a member of 4 Tp NZSAS in Nov 69. After a couple of patrols he was deemed to be unsuitable as a member of an NZSAS patrol. It was the dry season and he was very noisy when on patrol. (He could not sit still and he snored loudly). Patrol commanders refused to have him on patrols. This caused a hell of an argument amongst the troop and the troop commanders. There was no suggestion that he was not a good soldier. The solution was to transfer him to W3. [Sunray thinks the transfer would have been negotiated very quietly with Jim Brown, with possibly Dave Heywood being involved]. We estimate this was done in December 1969 or January 1970. Other members of 4 Tp remember that he did well in W3. We have no idea when he returned to NZ. We presume he would have returned directly to NZ at the end of the W3 TOD. We are also looking for photographs of this man (and any other former NZSAS) so could you ask your members if they have any photos of Lcpl Heremaia. Also any details about when and where he died?" I was There: Andy Anderson believes Lcpl Heremaia came to W3 as a sig attached to Coy HQ, when we operated out of FSPB Zilla [late May-June 1970] at the tail end of the dry season. He remembered because when he flew in, Hira said he couldn’t believe we used tents and hammocks, he was used to curling up with his gear and sleeping in the bush with the SAS. The NZVietVet Bravepages website shows Hira as having drowned in 1993. "ewe wernt rude im stilkl tryn 2 work outthis emale thing any way how r ewe"
Evan Torrance has contributed a comprehensive article of about 27 pages based on his personal journal. This is being edited before being published although some extracts are already on the website [here]. He has also been requested to add further detail where possible from the 1RNZIR days in B Coy, and to flesh out some other parts. Eventually the complete document will be offered as a downloaded .PDF document that others can use as a research source. If you would like a copy of the present document please request it from the webmaster [by clicking here]. The web site is working a treat. The phone calls with the others of the section have been wonderful after all these years. So much that I had forgotten about has come forth. And, over the weekend an email from Jim Mitchell, our company medic was a fantastic surprise. Great to hear from Mitch after so many years. Dave Spence and Harry Hemana have both passed on after illnesses. A report on Sgt Hemana's funeral is here. Doug Lewis is father-in-law of Rico Gear. Rico who..? You know, the winger for the Crusaders, top team in the Super 12 this weekend. And Stu Cameron is the father of Pero Cameron the Tall Black. Anyone claiming to know Carlos Spencer..? Dave Turner is now out of hospital and recovering at home after an angioplasty operation. the nominal roll has been developed to the point possible using historical references easily available to the OC and MFC. Your help is needed to finish the detail. Use this link. Roger over..? 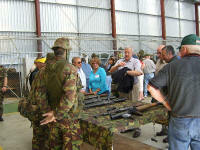 W3 members combined with V4 Company in Palmerston North March 2005 for a reunion. More detail and photos here. Another reunion is planned for 3 years time. an oral history project entitled "Voices from Vietnam" is underway headed by Baden Ewart [ex-NZ Component 1970 -71] which should see a wide range of stories recorded - three W3 people are on the list of proposed stories, more details as the project proceeds. 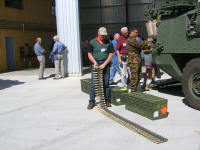 "will remain here until early June before heading back for the NZSAS 50th reunion in Papakura. Its on the weekend 10 11 12 June so any of the guys in the South Auckland area want to catch up send an email asap. Take care Duke"
I'm going to sit down and put together a 'history' of the Mortar Section. But it may take some time. I feel its important that we do this - the Mortars didn't spend a lot of time with W3 when in country and we worked with a lot of other units (3 Cav for example) and it would be remiss of me to fail to document the environment and how the section operated in that year. I am going to contact the others and try and get some feedback from them, and try and do a comprehensive history. I will keep you abreast of how it progresses and, perhaps, try and feed the history bit by bit so you can add to website. I think it would be great for the platoon commanders, and their section commanders to compile a history of each unit (not to mention Evan and the HQ component, as well as Assault Pioneers etc) and try and make this quite a comprehensive history. Vietnam War veterans from V4 and W3 Companies held a combined reunion in Palmerston North from 11-13 March 2005, during which the 1st Battalion, RNZIR hosted them at its Linton base. The veterans enjoyed the 1 RNZIR programme, which included a formal, yet light-hearted welcome “home” on the parade ground lead by a powerful powhiri. The Commanding Officer made us very welcome, lunch and briefing on the current activities of the battalion and an opportunity to see a display of current equipment; including a good look at the new NZLAVs followed. The reunion was based on the Palmerston North RSA and the programme also included a Saturday-night, dinner night and a Sunday morning Commemorative Service at the Palmerston North Square War Memorial. Predictably, the dinner went off well with a few veterans realising too late in the night that they were closer to 60 than 26 and suffering the consequent sore heads next morning. However, equally predictably, the service saw a full turnout. The service was simple but full of pride and respect, the focal point being the reading of the names of V4 and W3 Company members who were either killed in action or who have since passed on. Every veteran then laid a poppy with the wreaths at the memorial. The Government yesterday apologised to Vietnam War veterans who were exposed to Agent Orange or other toxic defoliants. Veterans Affairs Minister George Hawkins made the apology in the Government's response to the health select committee's Agent Orange inquiry. The committee called only for acceptance that exposure occurred, not an apology. 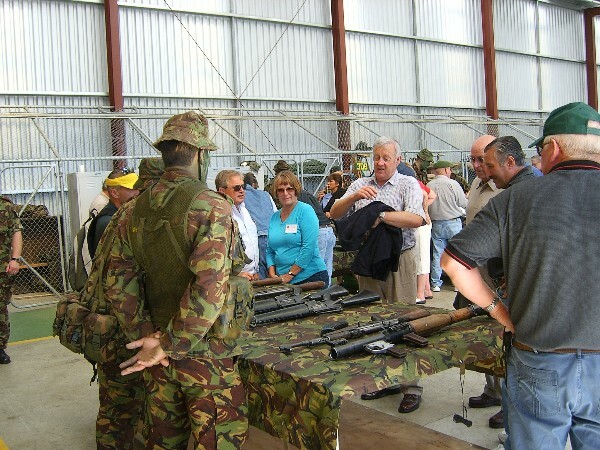 He said new information presented to the inquiry showed the extent of contamination by a range of chemicals of the part of Vietnam in which the majority of New Zealand armed forces served. The research showed there were 356 probable occurrences where New Zealand troops moved through areas that had been sprayed. "In light of the information ... the Government offers a formal apology to Vietnam veterans for the failure of Governments in the past to recognise that the veterans were exposed to a toxic environment ... " The response was tabled in Parliament. Mr Hawkins' spokesman said sending personal apology letters to affected veterans had not been considered, "but that's not to say it won't be". No extra payments to veterans were being considered in addition to the present system of pensions and medical benefits, he said. "It's quite a benevolent system." The apology comes in spite of Labour committee members previously resisting a New Zealand First bid for the committee's report to urge the Government to apologise and compensate veterans. The Government's response met praise from a veterans' group. The Ex-Vietnam Services Association's president, Rod Baldwin, said many veterans and their families had suffered physical and mental illnesses, plus the indignity and humiliation of the repeated denials of exposure to Agent Orange. "The Government's positive response to the committee's recommendations gives us confidence that there is a will to see justice finally done and that adequate resources will be provided by the Government to ensure the recommendations are properly implemented." But National Party health spokeswoman Judith Collins said the "pathetic" response lacked substance because it did not alter the limited range of health problems suffered by veterans' children for which the Government would pay the full treatment costs. Some faced considerable outlay for conditions not covered. "We need to have acceptance that those lists should not be exclusive and discrete." The Government says it provides fully funded care for a range of conditions, including spina bifida and acute myeloid leukaemia, and that the list is not conclusive. It will monitor international research and entitlements given by other Governments to Vietnam veterans' children.